Statues of officials, priests and nobles help complete the vision of part of the complex and varied society that existed under the pharaohs. Egypt was one of the oldest models of a state in humanity. Centred on the figure of the pharaoh, the the model of the State operated based on a strict division of basic functions (administrative, religious and military) and the existence of a large number of strictly prioritised positions. The role of the vizier, or prime minister, was to ensure compliance with the will of the King throughout Egypt. Supervisors of the king, nomarchs (or provincial governors) and other high priests and military figures also had great power and influence. Real armies of officials and writers made up the majority of the state bureaucratic apparatus. Artisans, peasants and soldiers, under the organisation and direct orders of their administrators, were responsible for the production, maintenance and protection of the essence of their civilisation. 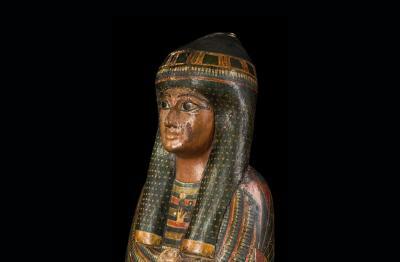 Cartonnage belonging to the Lady of the House Djed-Montu-iues-ankh (Montu has said that long shall she live), the wife of Pamiu (the cat). 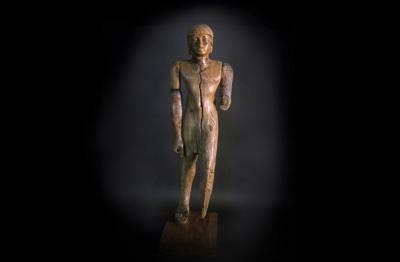 The Third Intermediate Period, 22nd Dynasty (945-715 B.C.). From the Middle Kingdom onwards, the title of Lady of the House was one of the most common titles used to refer to women of the elite. In noble households, the Lady of the House was responsible for most domestic activities such as making bread and beer, cooking, weaving, sorting grain, looking after the animals and artisanal production. 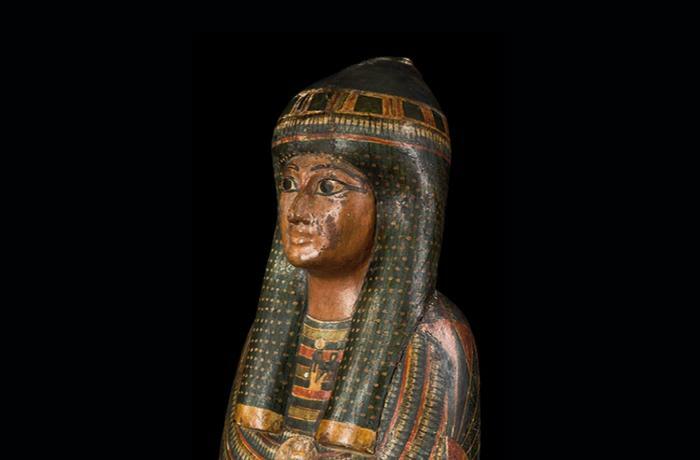 Their cartonnage features representations of a number of protector divinities, as well as the hieroglyphic texts that set out a characteristic form for petitioning offerings and provide her name and the name of her husband. Statue of a noble. The Old Kingdom, 6th Dynasty (2323-2150 B.C.). These works, which are of high technical quality, were incorporated into the tombs as material representations of their owner. They could be on their own of form part of scenes of everyday life, in which they usually appear as supervisors of various works. Statue of the Guard of the Room and Inspector of the Gardens of Amon, also known as Amenhotep. Sandstone. 18th Dynasty (1550-1307 B.C.). 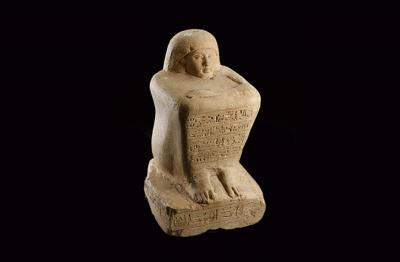 Amenhotep, kneeling, holds a stele with a hymn addressed to Re-Haractes. Behind him, another stele has a hymn addressed to Osiris and to Amon. Such statues were located in an open niche above the door of the private tebana tombs. Cube statue of Huy. Limestone. 19th Dynasty (1307-1196 B.C.). A beautiful and complete representation of Huy, whose titles are unknown. 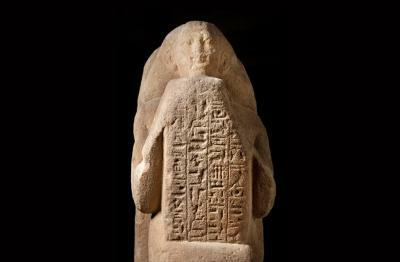 It is a highly emotive piece: the hieroglyphic texts indicate with the expressive phrase “... Of his son, which shall ensure that his name lives on...” which was dedicated by a son (the scribe Huy) to his deceased father. In addition, the platform bears the name of another son, the scribe Iny.